Simply put, your Statement of Purpose(SOP) is a substantial essay written as part of your application package to universities abroad. The word/page limit is usually set by the individual admissions committees at universities and may differ from one institute to another, but it’s typically between 500 to 1000 words. A well-written SOP must be an all-encompassing snapshot of who you are as a person as well as of your academic and extra-curricular profile, providing a detailed glimpse into your past achievements, skills, aspirations, and goals for the future. Tens of thousands of students apply to universities abroad for higher studies, all of whom may not be really invested in their discipline and want to pursue an MS just for the sake of it. The SOP, by demonstrating your long-term commitment to your discipline and your passion for the subject, sets you apart as a serious, dedicated student. outline your past achievements and accolades, be they your senior year thesis project, internships R&D work, paper presentations or work experience. also briefly touch upon your plans for the future: do you want to perhaps do a Ph.D. and then teach at university-level, have plans to undertake research work to help advance development in your discipline? Contrary to popular belief, your SOP is not supposed to be merely academic in nature, although of course, that will take the center stage. Remember, universities abroad are looking for a well-rounded individual who excels both inside and outside the classroom. Keeping this in mind, be sure to also include details of your extracurricular activities, especially if you’ve won awards and recognition in them. Your academic achievements and goals must be balanced out with a mention of how you spend your time outside the classroom. to name a few: all of which are held in high regard by universities in the US. In short, your Statement of Purpose(SOP) needs to tell a story about you, that is captivating for its readers. Click here to get the complete GREedge eBook on effective Statement of Purpose(SOP) writing with examples, and a university-specific approach! Let’s now move on to a question that frequently plagues students: why exactly is a Statement of Purpose(SOP) needed? Why is an SOP needed? The top universities abroad are typically inundated with thousands of applications from students just like you, every intake season. Now, here’s the catch: many of these applicants have academic credentials and achievements similar to yours. So, how do they go about picking the successful applicants, when all they have is, say, a hundred seats in a particular program? They certainly can’t accept everyone, stellar though their application may be. Sounds daunting, right? Well, this is where the Statement of Purpose comes in. A brief, yet thorough encapsulation of your goals, aspirations and past achievements, the Statement of Purpose(SOP) is one of the key elements used in filtering out the promising candidates from a pool of similarly qualified ones. Hence, the Statement of Purpose(SOP) is the linchpin to your grad school dreams, and it is absolutely crucial to get it right. The Statement of Purpose(SOP), in many ways, is the closest thing you get to a personal interview with the admissions officers at your dream university. But luckily, unlike the interview where you have to come up with convincing, satisfying answers on the spot, with your Statement of Purpose(SOP) , you get to take sufficient time to craft it to perfection so it reflects the best possible version of you, and portrays you as someone who is passionate and deeply committed to their dreams and aspirations. More than just that, the Statement of Purpose(SOP) is a great way to stand out from a sea of people with the same GRE scores and GPAs as you. While your GPA, GRE/TOEFL scores & CV are just numbers or a merely mechanical iteration of your skills and abilities, your Statement of Purpose(SOP) is a personal story, and talks about your skills, dreams, goals and achievements in a manner that the other components of your application package cannot. Say, for instance, your GPA suffered a setback in the sixth semester due to some unavoidable personal circumstances. While your academic transcript will merely reflect the low GPA for that semester, your Statement of Purpose(SOP) could be used to talk about how, despite an illness or injury or other personal issues, you managed to study and get a modest grade. Or how you managed to overcome the setback and come out stronger for it! This will portray you as someone who’s determined and dedicated to his studies, and also as someone who’s undeterred by hurdles. In other words, your CV, GPA and GRE scores relate facts; your Statement of Purpose(SOP) tells a personal story. Your Statement of Purpose(SOP) is also the perfect opportunity to showcase your research experience, internships, paper publications, participation in conferences, international exposure or experience of working in a diverse environment, and other achievements that your peers may not normally have access to. Because of these reasons, the SOP is very often used as a tool to determine the bestowal of financial aid and much-coveted Teaching/Research Assistantship opportunities. 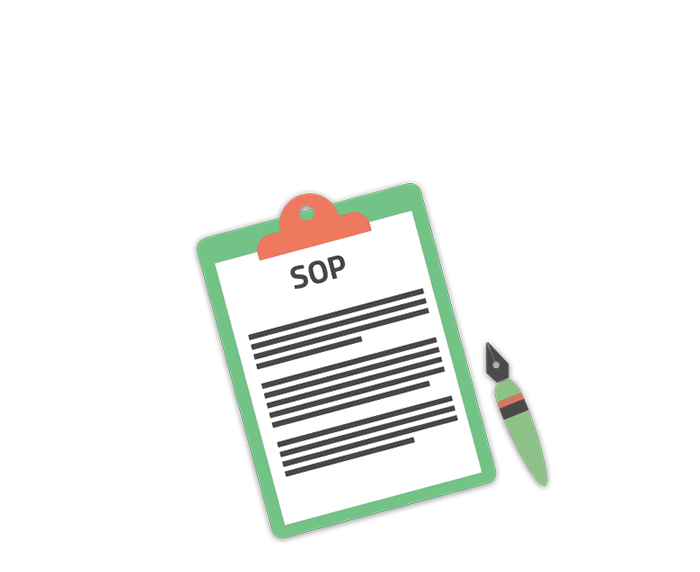 Now that we’ve seen what exactly makes the SOP such an important document, let’s take a quick look at how to write a winning Statement of Purpose(SOP), as well as some handy tips and tricks. What are the ingredients that go into making a top-notch Statement of Purpose(SOP)? Let’s take a look, shall we? 1. Word limit: Sticking to the word-limit assigned by the university is of paramount importance. No one wants to read page after page of information, no matter how interesting or inspiring. Moreover, not adhering to the word limit can often lead to on the spot rejections. Ideally, your Statement of Purpose(SOP) should be anywhere between 500 to 1000 words long, although the word or page limit is often specified by the university. If you can’t find any information on the website, you can contact the relevant staff and have it clarified. Under no circumstances should it exceed 1200 words. 2. Keep it simple and eminently readable: While it might be tempting to use different colored fonts, highlights, and underlines to highlight parts of your Statement of Purpose(SOP) that you deem important, it's a good idea to keep your Statement of Purpose(SOP) looking as neat as possible. be sure to use a consistent font and font size. We highly recommend Times New Roman in size 11 or 12, for your Statement of Purpose(SOP). Doing so ensures greater readability and prevents your reader from being distracted by other unnecessary elements. 3. Begin with a memorable paragraph: It’s important to have your reader hooked to your story right from the beginning, and keep them wanting to know more. What do great novels like Anna Karenina, The Great Gatsby, and Pride and Prejudice have in common? A memorable opening, of course! You can choose to either begin with a quote that’s pertinent to your goals or a personal story about how you discovered your passion for your discipline; either way, you are sure to keep your readers intrigued. 4.. Don’t overshare: Though the Statement of Purpose(SOP) is a comprehensive essay, you need to be prudent about the kind of details you choose to share. Every single fact you weave into your Statement of Purpose(SOP) should have some pertinence to your grad school dreams and your goals for the future. While you may be proud of your ability to finish 5 pizzas in an hour and might have even won 1st prize at eating competitions, it’s not necessarily something you should be writing in your Statement of Purpose(SOP), unless of course, you're applying to a master's program in culinary arts or gastronomy. 5. Co-curricular activities: Internships, paper publications and presentations, participation in conferences and research experience should all find a place of pride in your Statement of Purpose(SOP). These not only add a special edge to your Statement of Purpose(SOP) but also set you apart from your peers with similar qualifications. 6. Extracurricular activities: As we mentioned previously, universities in the US are not simply looking for students with high GPAs, so be sure to highlight your achievements outside the classroom too. Whether it is your passion in the football field or your prowess for music, it merits a mention in your Statement of Purpose(SOP). 7. Avoid excessive flattery: While it’s great to gush over the repute of the university and the professors who work there, avoid going overboard: the universities are well aware of where exactly they stand, and are likely to be put off by too much flattery. We hope you found this article helpful, and wish you all the best for your future! Want the lowdown on how to draft SOPs according to various countries and university departments? Be sure to click on the link below! Want to find out how you can write an Statement of Purpose(SOP) that gets you your dream MS admits? Download the exclusive GREedge guide to doing just that, now!